Nice detail at the back. Modelled control console. The grab rails are solid and part of the casting. 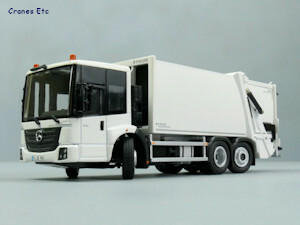 The Mercedes-Benz Econic is a special purpose truck aimed at municipal and distribution applications. 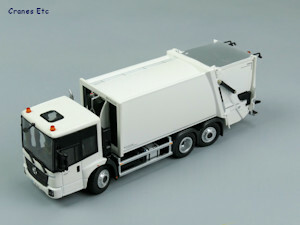 This model is fitted with a Faun Variopress Refuse Truck body. 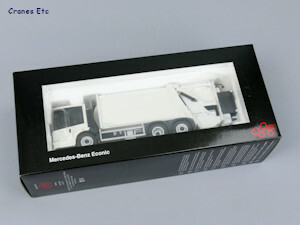 The model comes in a NZG branded box with a window. 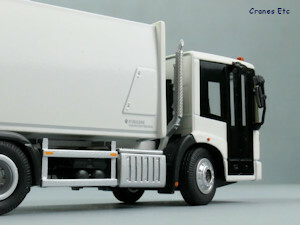 There were no defects or missing parts on the review model. There is no information about the real machine or the model, and no assembly is required. 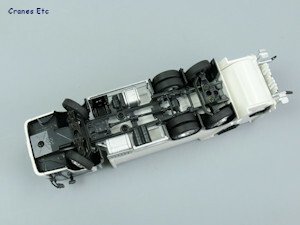 Underneath, the 6x2 chassis and tanks are detailed in metal with the front and rear steering linkages being modelled for functionality rather than detail. The tyres have a decent tread pattern and are the same on all wheels. The metal hubs are detailed. The cab is very good. There are beacon lights and a see-through roof light. The mirrors are plastic and the doors look good including the bus-style folding door. The lights are painted and there are some tiny graphics. Inside, the detail is good including a Mercedes-Benz logo on the steering wheel. There is a dummy number plate front and rear. Behind the cab there is a realistic looking exhaust pipe. The body is metal and has a very solid feel. The access plate on one side is modelled and there are nicely painted hydraulic lines on the roof. A silver hazard stripe runs down the sides. At the back the tailgate is also metal and robust. Grab handles are not fully formed but are part of the casting and paint tipped, and the platforms are metal. 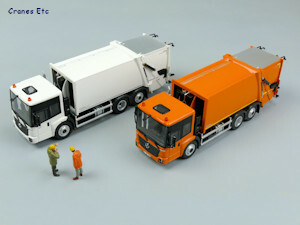 There are control consoles on each side and the loaders are also modelled. The rear mirrors and camera stalks are plastic and a little delicate. 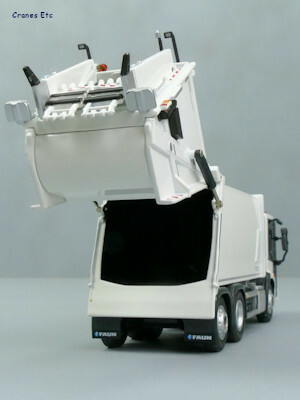 Inside the tailgate the non-functional compactor can be seen, and inside the body the there is a non-functional ejector moulding. The truck rolls well and the front axle steers to a very good angle. 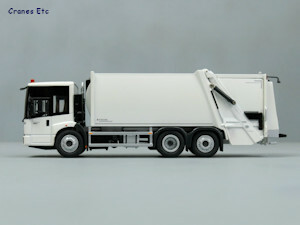 The rear axle has steering also and a moderate angle is achievable. The tailgate opens and the rams are stiff enough to pose it raised. 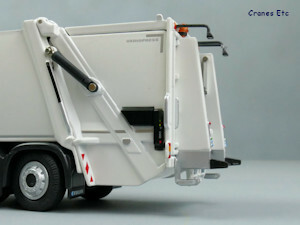 Two loaders for bins are hinged and can rotate. The bin stops also move. 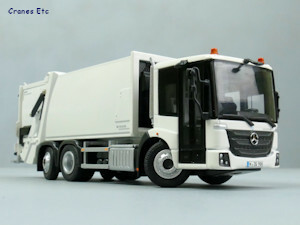 This is another heavy Mercedes-Benz model by NZG with only the plastic mirrors being a little delicate. The paint finish and graphics are very good. 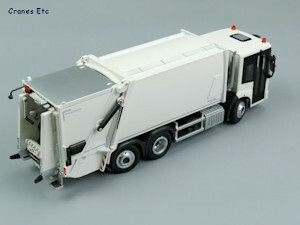 This model of the Econic looks good with a quality feel. The Faun VarioPress is also modelled very well. 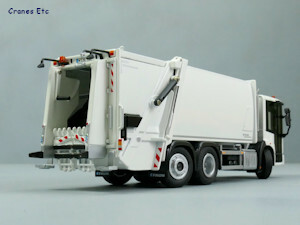 The model first appeared at the Nuremberg Toy Fair 2015. 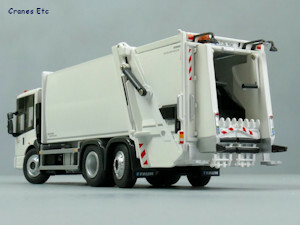 Distinctive Econic cab with folding door. Hydraulic lines on the roof.